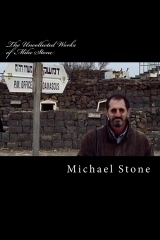 The Uncollected Works of Mike Stone (1965 – 2011) is an uncollection of poetry and prose from university years prior to being drafted into the US Army, active duty in Europe, and return to normalcy. Then events took a turn into another dimension altogether. The uncollection includes moral dilemmas for the modern man who finds himself in an amoral world without an instruction manual, a photo album with only words that evoke pictures not to be found in anyone else’s photo album, and a journal of first-hand experience undergoing basic training, as a new immigrant, in the Israeli army reserves. You can search inside my book on Amazon, if you feel like browsing before you buy. If you like a page, though, you will still have to buy the whole book. I’m not Paul Reps, hanging the pages of his poems with clothes pins on a clothes line, 10 cents a page (free for lovers of Buddha).